Crissy was born 2/20/1996 in Waco, TX. I was in Dallas attending a training class and found an ad in the paper. 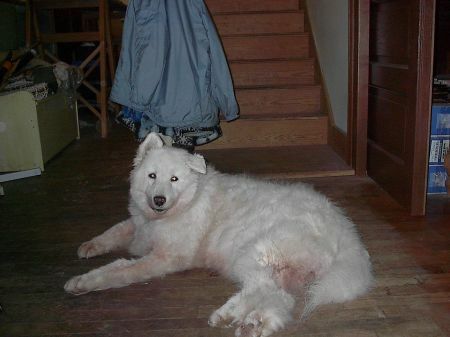 I had just lost my prior Samoyed, Lacey, to cancer and although my son had given me a male, American Eskimo puppy just weeks before, really wanted another Sammie. She was just 5 weeks old when I got her and she rode back to Arkansas under the front seat of the car. Her and Dinky Bear became instant sister and brother. He took the role of big brother because he was exactly 8 weeks older. He'd rip up her 'babies' and attempt to dominate her, but would also lick her face and pull apart his rawhide bone and give some to her. By the age of 3 months, Crissy's medical problems were coming to light. She had slight paralysis on the right side and her right ear did not stand erect. By age 4, she had ballooned up to 90 pounds (and Dinks still was only 30!). She was diagnosed as hypothyroid and began medication and a reducing diet. In 2002, we actually over-medicated her and she had what is referred to as a 'thyroid storm' experience. It was frightening and I thought she would die before I reached the vet's office. She suffered from such strange symptoms: bouts of heavy panting, excessive water drinking, and times when she just didn't seem to be 'with' us. She was always hungry. I asked that she be tested for Cushings' syndrome. They ran an ACTH stim test and the results were negative. We decided to clip her heavy coat for the summer and her hair refused to grow back! Not even a fraction of an inch. In 2003, I took her to Tulsa to a 'specialist' and they tested her for Cushings' via an LDDS test and did ultrasounds on her adrenals. Both were enlarged and 'twisted'. But the test results still came back negative. In the spring of 2004, one of the dogs started having 'accidents' in the house and my son was convinced it was Dinky. Turned out to be Criss. I caught her in the act in May. Something still wasn't right, so I took her to my local vet and he discovered she was diabetic with high, high bg's. She spent 3 days in his hospital, getting regulated. And we entered a new era. I made an appointment with the University of Missouri for early June of 2004 and arranged to spend at least 2 days in Columbia. That trip, they repeated the various Cushings' tests. In mid June, Dinky suddenly developed Hemangiosarcomas and passed away in my arms just 17 days after he showed his first symptom, not eating his dinner. I don't think Crissy got to say a proper 'good-bye' to him, since she was going blind with cataracts. She and I returned to the Univ. of Mo. in July. This time they took multiple skin biopsies and more blood to send to the University of Tennessee for a full adrenal panel. She was diagnosed with 'atypical' Cushings': congenial adrenal hyperplasia-like syndrome. She was started on Lysodren, a chemo drug. 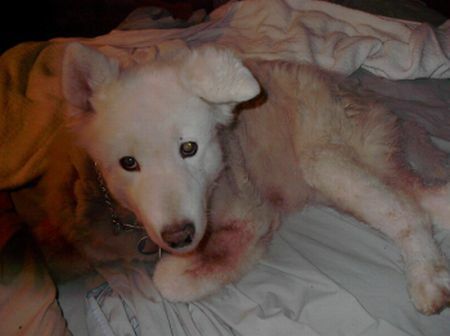 This is Crissy before treatment for atypical Cushings. This is Crissy after treatment! In October of 2004, we transferred her case from Missouri to Oklahoma State University (about half the distance away from me, but still 185 miles) and she was scheduled for cataract surgery. I was terribly excited. 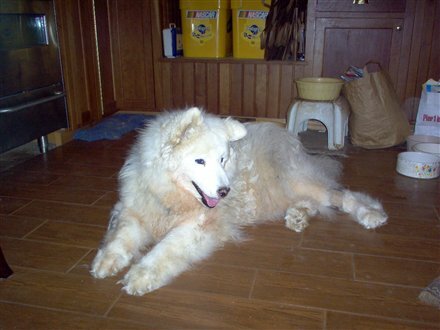 Her hair and skin were now back and her weight, so she looked like a Samoyed again. Eight days after her surgery and less than 24 hours after her post-op check up, I awoke to her crying and pacing the floor. I knew something was wrong. I had her at my vet's when he arrived that morning and he immediately called the OSU ophthalmologist. My vet was able to look for any bleeding or pulled stitches. We decided to rush her back to OSU. When I got there the pressure in her right eye was 91; 9 times too high! They were able to bring the pressure down with eye drops, but the damage was already done. The retina and optic nerve had been destroyed. In Feb. 2005, Crissy had her right eye removed and a prothesis put in. She was then on several different glaucoma eye drops in the remaining eye. By the fall of 2006, the sight in that eye was gone. We elected another surgery to remove the eye and another prothesis. So my girl has gone blind twice. She has terrible arthritis and has been on Metacam and Adequan shots for almost 4 years. She also takes tramadol daily for pain. My brother-in-law built her a ramp to get in and out of the house. Crissy Ann is the sweetest girl in the world. She has been through so many things. Her diabetes and Cushings' are under control, but she has been dropping weight to the tune of about a pound a month since last summer. She now weighs less than 57 pounds. She takes a total of 34.5 units of Humulin N via 3 injections a day. She takes 1500mg. of Lysodren acoss each 8 days. She gets a vitamin, a joint supplement, pancrenzyme, and Milk Thistle daily. I just got back from taking her and the 'boys' to Florida. My 88 year-old mother wanted to see Criss. 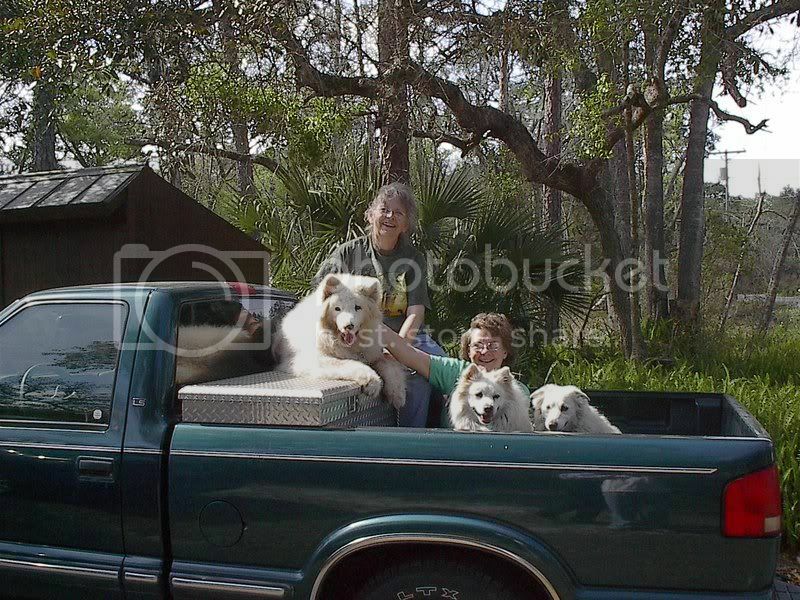 Here's a link to a picture of us riding in the back of a pick-up. Something Criss wanted to do once more. I decided that Criss' story needed to be completed. Here is the post I made upon her passing away. Crissy Ann went to join her beloved Dinky Lee at the Bridge today. Criss passed away on her own at 2:36PM CDT on March 11, 2009. She was 13 years and 19 days old. She had been having random bouts of excessively high bg's for the last few months. Her most current problems began last Sunday night and she started another round of antibiotics on Tuesday morning. She had a rough night last night, drinking excessively with heavy panting and constant urination. This morning she ate most of her breakfast, took her pills and insulin shot, and even ate her 'good-bye' cookie as I went off to work. At noon, I found her lying on the kitchen floor with her right back leg under her at a strange angle and Criss in kind of a 'shocked' state. I called my vet's office and he had left after the morning's surgery, but was told to bring her in and they would locate him. I was on the phone with Judy (angelbudsmama) deciding that it was time to free Criss from her pain and struggle. By the time I got Criss to Dr. Mayfield's my son and his girlfriend were there to say their good-byes. Criss decided not to wait for the doctor and I kept rubbing her front paw and telling her it was alright to leave me. She obeyed because Crissy was not only the prettiest and sweetest girl in the world, she was also the best girl. Good girl, Crissy Bear. Mom will love you forever. Wow Bonnie, I had never heard this full story of Crissy! Poor darling has had such a tough time. She really hit the jackpot when she came to live with you and I can see by the photo you think you are pretty lucky too. Thank you so much for sharing Crissy Ann's journey with me. It gives me hope for Bella. There is so much info out there on Cushing's & diabetes. When I came across info on the web for the normal lifespan of a Cushing's dog.... 30 months, I totally lost it. Like Crissy, Bella also has been tested for both Cushing's & diabetes in the past with neg. results. My cocker spaniel Beau had lost one eye to acute glaucoma & recently had his second eye removed for the same reason. We try to save his eyes for several years with drops, but knew as time progressed he could lose them both. Beau is 12 plus years. He was a foster baby that never left my house. Beau's previous life was horrific- severely abused. He came with a lot of baggage, behavioral wise & health wise. For a blind dog, he gets around great. On this anniversary of your journey to the Rainbow Bridge, I just want to tell you how much you are loved and missed. Sending our love too Crissy Ann... Chris and I always have considered you and Bonnie part of the family. Crissy Ann has a wonderful legacy to offer to every dog diagnosed with Cushing's and especially with atypical Cushing's disease, in the story of her long road to finding the right treatment and in the moving pictures of her miraculous recovery. Any time anyone has doubts about whether a Cush dog should be treated, Crissy Ann is there to show what a tremendous difference it makes to treat it. Thinking of you as you miss your girl today. Crissy Ann's story continues to help so many others. As I posted on the Cushings site you and Crissy Ann were such an inspiration to me when we were dealing with Cushings and Diabetes and senior care in general. It's hard to believe that a year has gone by since she left us for the Rainbow Bridge. I know our girls are having a great time together.